Between 2010 and 2018 outhousepatrol.com spent several thousand hours researching various projects. Montana Territory business licenses receipts (between 30 and 40 thousand) were searched in most mineral producing counties in southwestern Montana. Names, place of business, fees and dates of operation were logged. Montana Territory, in 1865, mandated licensing fees for hotels, saloon, liveries, and other business type. More that 4,700 names covering the period 1865-1886 were retrieved. The Montana licensing fees were modeled after Federal licensing that the forerunner of the IRS instituted to pay for the Civil War. Extensive research was conducted on IRS records existing for Iowa and the major gold producing areas of California. Iowa records exist starting in 1862, California records (1863-1866) total more than 2,700 entries. This search was limited to gold country hotels, saloons, (retail and wholesale liquor dealers), liveries, eating houses, and apothecaries. They were the high-volume types of businesses we thought had the best chances of yielding antique bottles or other gold rush artifacts. Were obtained from the BLM covering the years 1868-1900. Have done extensive research in the area in and around Butte, Montana, “The Greatest Hill on Earth”. More than 1,200 claims were patented within a few miles of Butte. The mining law of 1872 required a survey of all claims that any miner wished to patent and obtain “surface rights”. The miner would have already had mineral rights for his claim providing he performed the annual assessment work. We retrace these surveys using the Deputy Mineral Surveyor’s field notes to find precise shaft locations, water ditches, open cuts across the vein, or any structures upon the claims. We are interested in partnering with serious bottle diggers. OUTHOUSEPATROL.COM has been featured on the Front Page of the Montana Standard May 23, 2011 Full Color above and below the fold, we are the headline “OUTHOUSE DIGGERS”. Montana Magazine Mar/April 2011 with 4 pages color spread. Other Montana newspapers featuring us were Bozeman Daily Chronicle, The Madisonian, Butte Weekly, and twice in the Boulder Monitor. The Montana Historical Society, organized in 1865, is the oldest historical society west of the Mississippi River. Business license receipts for old Deer Lodge County exist in their archives from as early as 1867. In an attempt to create a “History of Pioneer Businesses” I have surveyed county business licenses thru 1879. I have logged the business records of Jefferson County thru 1886, Gallatin County thru 1877, parts of Madison County were logged thru 1873. Lewis and Clark through 1873. Nearly 2,000 names of licensees appear in these records. Counting renewals I have logged nearly 10,000 entries! Saloons, Hotels, livery stables and others business types paid a license fee. A few types of businesses were exempt. More than 45 differents sites had licensed businesses, more than half of these sites were placer camps. Names of the owners of hundreds of saloons, dozens of hotels, located on several dozen sites, RESURFACING AFTER 140 YEARS! I have included a breakdown of all businesss license fees. Wagon loads of goods were taxed as they rolled thru the street of Helena. Dance halls paid $100 per month, serious money in the 1860’s. Saloons were assessed based on the sites population. We can track the rise and fall of a sites population just by following the change in fees for the camps saloons. We are interested in contracting to search for bottles and other artifacts on old stage stops, hotel sites, and other historic spots in Deer Lodge, Jefferson, Gallatin, and Madison counties. Pioneer ranches, even those off of the main travel routes often had saloons and hotels, at least during the time of a local “Gold Rush”. We use electromagnetic imaging equipment in our searches. We have been featured in Montana Magazine Mar/April 2011, we have also appeared in the Bozeman Daily Chronicle, Montana Standard (Butte), Boulder Monito,r and several other Montana and Iowa newspapers. WE HAVE THE BUSINESS HISTORY OF ALL SITES LISTED BELOW! Bear Station, Bearmouth, Beartown, Blackfoot Agency, Blackfoot City, Butte, Cable, Cariboo, Carpenter’s Bar, Deer Lodge, Divide, Emmetsburg, French Gulch, French Woman’s Ranch, Georgetown, German Gulch, Gold Creek, Greenwood, Gwendale, Hell Gate Valley, Highland City, Jefferson Gulch, Levengood, Lincoln, Mc Clellan Gulch, Mc Minnville, Mead’s Station, Moose, New Chicago, Phillipsburg, Pike’s Peak, Pioneer, Race Track, Red Mountain, Reynold’s City, Rocker, Silver Bow, Top of Deep, Tower, Vestal, Walkerville, Warm Spring, Washington Gulch, Yam Hill, Yreka, and more. Montana Territory was organized under act of Congress, approved May 20, 1864, and amended March 2, 1867. In 1873 a portion of the old territory of Dakota was added to Montana, and thus the act of establishment and organization was completed. Incorporated into the new territory were present day Missoula and the placer camp of Bannack, site of the first large gold strike within the present boundaries of the State of Montana. 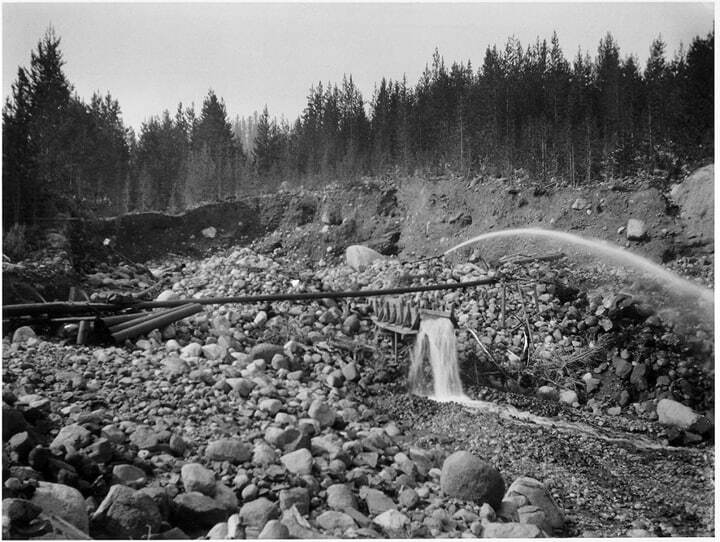 Gold Creek, then inside the borders of Deer Lodge County, may have been the first discovery of gold. The first territorial legislature met at Bannack on December 12, 1864. Among many problems, including bickering between the Union and Confederate sympathisers, the main problems was that newly formed Montana Territory was broke. Legislation was passed to get a cash infusion. With no funds to pay for bridge and road construction, the legislature authorized 23 companies or individuals to build privately funded works. The territory authorized bridge and ferry companies to locate on the Jefferson, Big Hole, Beaverhead and Marias rivers. Unlicensed bridges also were built, serving a need when it arose. Some authorized tolls were as high as $5 a wagon, close to $200 in today’s money. Others have written in some detail about this “highway robbery”. The territory also passed license laws. Saloons, hotels, photographers, pack peddlers, bankers and most other businesses were taxed….HEAVILY. Little, however, has been written regarding these licenses. Saloon keepers paid $30 a quarter for a business license, the hurdy-gurdy or dancing saloon coughed up $100 a month…..5 ounces or more of gold to pay for that license. When compared to the price of gold today, about $7,000! The first batch of records in Deer Lodge County covered just the latter part of 1867. But the year 1868 appeared complete. No less than 147 saloon licenses were issued in 1868 alone! 104 merchants and 35 hotels were licensed in 1868 as well. Continuing the data entry thru 1879 I found nearly 2,000 different licensee entries ( individual business owners can be followed from camp to camp with these records). Most licenses were for a 3 month period and about 10,000 license extensions had to be logged to re-create the business history of the camps, first merchant in, last saloon to fold. Vital businesses such as tanners, millers, and the blacksmiths were exempt from paying license fees. Many of these names will be lost to history. But after weeks of data entry and deciphering signatures, the names of most saloon operators now exist in a database. Also names of the vast majority of merchants, brewers, hotel keepers, jewelers, even the magician who came to camp, all of these have appeared, re-surfacing after 140 years. Even the name of Hong You Ac, the Chinese Hog Peddler of Pioneer! The county, in western Montana, at one time extended from the Big Hole River to the Canadian border. One of the 9 original counties, it has split several times. The Butte portion became Silver Bow County in 1881. Deer Lodge City lost the county seat to Anaconda, Deer Lodge City ended up as the county seat of newly formed Powell County…Anaconda became county seat of Deer Lodge County. Granite County split off in 1893. The borders have changed, but the colorful gold rush history remains. Now, for the first time, we can get an accurate picture of the business vitality of all of the placer camps, trade centers, even the stage stops of Old Deer Lodge County. The story of Pike’s Peak, as told by the license receipts, shows Keenon & Myers opening the first store in May of 1869. This operation closed up shop by September, 2 saloons operated during the winter of 1869-1870. July of 1870 saw 4 merchants and 6 saloons operating, but by the end of October all of the merchants had packed up. By December 5 saloons were still operating, 3 operated into the next placer season. July of 1871 appears to be the peak of business activity, 4 merchants and 6 saloons were open. However, by the end of September the last of the merchants had departed..forever. On or before the 15th of December, 1871 George Perry’s Saloon served it’s last beer, shoved the last shot of whiskey across the bar, and then tossed the last empty bottle of Kelly’s Bitters into the creek. The first edition of the territorial license laws went into effect on February 9, 1865. Section 1. There shall be levied and collected by the tax collector a license tax as follows. First– From EACH billiard table kept for public use twenty dollars per quarter. By March 1, 1867 the rate dropped to $16 per quarter. By January, 1870 the rate had been reduced to $10 per quarter. Second– From the manager or lessee of every theatre $5 per day or $50 per month, and for each exhibition of serenaders, opera or concert singers, dance houses, hurdy-gurdy houses, minstrels, sleight-of-hand performers, legerdemain and all other performances at the same rate. Monthly rate reduced to $30 by January 1870. May 8, 1873: $2 per day, $20 per month. Third– All dance houses or hurdy-gurdy houses shall pay $5 per day, or $50 per month. By March 1, 1867 the fee had climbed to $10 per day or $100 per month. The hurdy-gurdy, sometimes called a dancing saloon, gets it name from the hand cranked musical instrument of the same name. These mining camp dances were like a fancy dress ball, several girls, a dollar in gold got you a dance. 50 dances were on the menu for the evening, half the gold went to the owner, half to the girl. The house may have gotten rich, but the girls did well, $25 in gold for a night of dancing. It shall be unlawful after the passage of this act it shall be unlawful for any person or persons, with the Territory of Motana to conduct or establish, or cause to be conducted or establish, or cause to be conducted or established, any dancing saloon or hurdy house. Fourth– Each and every insurance company…..$50 per year in 1865, by 1867 the rate was $80 per year May 8, 1873: $150 per year. Fifth– From each pawn broker, $50 per quarter: dropping to $25 per quarter in 1867. May 8, 1873: $10 per quarter, providing he shall work for compensation. Eighth– Each professsional man, before practicing as such, all lawyers, surgeons, physicians, dentists and all other professions shall pay a license of $20 per annum, $16 a year by 1867. Section 2. All keepers of livery and feed stables shall pay a license of $15 per quarter, hay yards for feeding stock or selling hay paid $10 per quarter. 1870: $8 Ranchmen who keep or herd stock for hire were charged $15 per quarter for a license, dropping to $10 by 1867. Section 3. Relates to selling of bonds, loaning money, dealing in gold dust. $35 to $75 per quarter. According to business volume. Section 4. Bankers, $35 to $65 a month, depending on volume of business. Section 5. Merchants dealing in goods, wares, merchandise, liquors, drugs or medicines: $15 to $50 a quarter, dependent on volume of business. Provided: No liquor and wines sold in quantities less than 1 gallon, but by May 8,1873 law read no quantities less than 1 quart. Auctioneers: Indoor auctioneers pay $10 per month, outdoors auctions license, $25 per month. Hotels, Inns, Boarding Houses: $10 per quarter, dropping in 1867 to $4 per quarter if quarterly volume is under $1,000, additional $4 for each $1,000 of business per quarter……..License fee $5 per $1,000 by 1873. Saloon (Retail Liquor Licenses) $50 per quarter, rate was $15 if within 3 miles of incorporated city or town. Saloon Effective March 1, 1867 Quantities less than one gallon, $30 per quarter, if 2 miles or more from a town or city, $10 per quarter. Population: 300 or more, $30 per quarter. Population: Less than 300, more than 50, $15 per quarter. Population: no nearer than 3 miles to town, city or village: $8 per quarter. Saloons, effective May 8, 1873: All saloons where women are kept as waiters, $5 per day or $50 per quarter. Population: 300 or more, or within 1 mile of the limits, $60 per quarter. Population : 100 to 299, $40 per quarter. Population: 40 to 99, $25 per quarter. Population: less than 40, $15 per quarter. Section 8: Peddler: Every traveling merchant, hawker, or peddler who shall carry a pack or trunk, and shall sell goods or merchandise shall pay a license of $5 per month, doubling to $10 per month by 1867, ( 1870: $8) every person who sells provisions not raised in the Territory shall pay a license of eight dollars per month. Wagons, $10 for each wagon loaded to a value of $1,000 assessed at 1% of excess of $1,000. By 1867 it was $5 for the first $1,000, ½ of 1% of any excess. 1870, flat fee $5 per per wagon, PER MONTH. As stated above, this section of the law pertains to goods, wares, merchandise, or provisions not raised in the territory. Pack animals, fee of 25 cents for the first $200 , ½ of 1% of any excess. 1870: 50 cents for each pack or load so offered for sale. 1873: $2 per month for each pack animal. Steamboats, other water craft: Transient merchant to pay fee of ½ of 1% of the value of cargo. 1865 Law: All person with droves of stock coming into the territory shall pay a license of $1 for each head of neat cattle, horses, mules, or asse, and thirty cents for each head of sheep or swine so offered for sale. 1867, Section 10: Any person bringing or procuring to be brought into the Territory any drove or droves of cattle or horses, mules, asses, sheep or swine for sale after the first day of September of each year, shall pay a license tax as follows. For each head of cattle, horses, mules, or asses, fifty cents. For each head of swine, twenty-five cents. Section 12: Brewer or manufacturer of malt or spirituous liquors, or reftifier of the same, or manufacturer of pop, beer or drinks put up in bottles, shall pay a license of $10 per month. 1870: business over $1,000 per month, $20; under that amount $5 per month. Section 13: Banking game or other game of chance or gaming table: $50 per month for each house so kept. May 8, 1873: Population greater than 500, $40 per month; population from 100 to 499, $20 per month; in all other places, $10 per month. Section 14: Butchers, $5 per month, those 2 miles from town and monthly receipts less that $1,000 a month, $5 per quarter. Section 15: Picture galleries, daguerreotypist, ambrotypist, photographist or other artist, shall pay a license of ten dolars per quarter. Section 16: That all male persons in this territory who are now, or who may hereafter be, engaged in the laundry business shall pay a license of fifteen dollars per quarter. Section 17: Every person who shall carry on the lottery, or gift, or prize distribution business within this territory, shall pay five per cent on the amount of property so disposed of. Section 18: Every keeper of a bowling-alley shall procure a license, and shall pay therefore the sum of five dollars per quarter for each alley so used.. Section 19: That any company having a line or lines of telegraph in the territory shall pay a license as follows: On every business office kept in any city, town, or village containing a population of three hundred persons and over shall pay a license of ten dollars per month; all other telegraph offices kept on road or stations, where general business is transacted, shall pay a license of five dollars per month; said license to be procured in the counties where the said offices are established. My research indicates that about 90% of Deer Lodge County business license receipts survived, while 10% of Deer Lodge County license records may be missing, the fact that all retailers paid a quarterly fee allowed me to track most licenses in spite of the missing records. The only major gap in Deer Lodge County business receipts was for the first 11 months of 1873. Despite the lack of coverage for most of the year, the fact that due dates were exactly 3 months apart, to the day, allowed me to track a business history in spite of missing items. What records were missing in 1873 usually showed up again in 1874. A few short term businesses that opened in 1873 are lost to history, but little else appears missing except for about 2 months worth of water damaged records from 1879. Similar records to these just do not appear to exist from any other state. The license receipts are the official record of business activity in Montana Territory 1865-1893. The Federal Census is taken every ten years, and Montana Territory never conducted a census. Newspaper accounts give us a good picture of the happenings in Deer Lodge fairly early on, Butte had grown quickly in the latter 1870’s and it expanded into the greatest mining camp in the history of the world. It had close scrutiny. But neither a newspaper nor a census reported Henry Milot operating a saloon at Bratton’s Diggings in 1867. The Helena Daily Independent reporter passed through the placer camp of Yam Hill in July of 1875, they reported 2 hotels operating but gave no names. My research indicates that Mrs. Nesbitt ran one hotel for just three months over the summer. Horn & Barton were licensed for 6 months beginning on May 15th. The research on Lewis and Clark County continues. Historians, Researchers, Artifact Hunters, Bottle Collectors.